"The Alarm Wrist Watch" Part 6 in a series by B. Humbert. This is a magazine article which was carefully removed directly from a 1960 Swiss magazine. Main text in the article is in English. 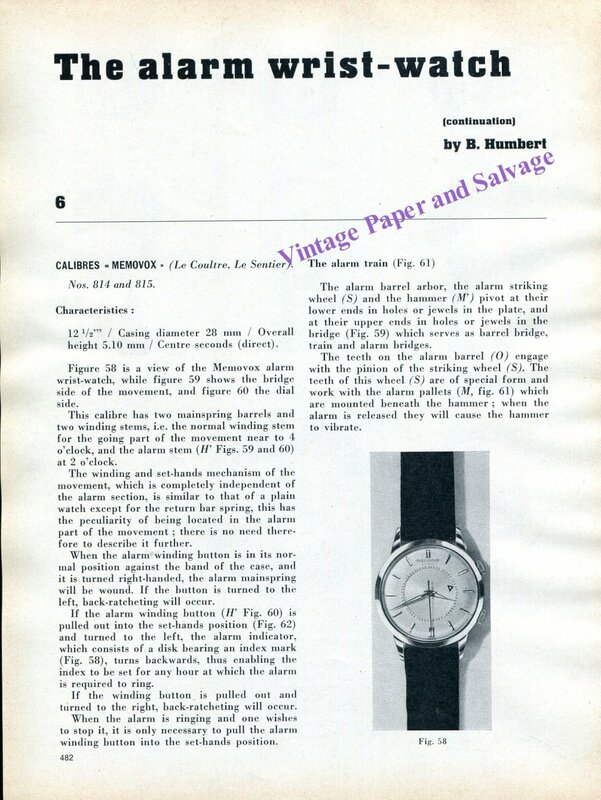 The article pertains to the Calibres Memovox (Le Coultre, Le Sentier), Nos. 814 and 815. The magazine article is approximately 11 pages in length (on 6 sheets of paper) and includes a number of diagrams within the text. The article was carefully removed directly from a magazine. (No watch, clock, parts, tools, or other items are included.) The rest of the magazine is not included. This magazine article is part 6 in a series. Other articles in the series are not available nor included. As with most paper items, light wear and small imperfections are to be inspected.